This is the Big Red Box! These beefy, bright red, flanged, plastic enclosures will give your widget the protection (and attention) it deserves. You've probably seen these used to enclose radio equipment or antenna baluns as they can be secured to a pole using U-bolts (not included). At about 3mm thick, this 74x158x90mm enclosure has plenty of space for gizmos, gadgets, widgets and doohickeys. The mounting flanges extend 19mm from either edge with two 50mm-spaced 7mm diameter holes. 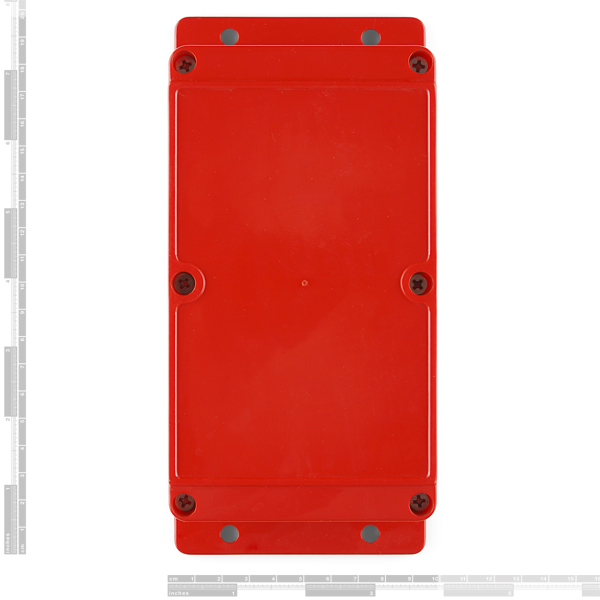 There's a rubber gasket around the inside of the lid which forms a dust and moisture resistant seal when the screws are tightened down making the Big Red Box essentially weather/water proof. The lid is secured with six 4mm screws (included). The drawing referenced in the link has an error. The 122mm dimension should be 124mm. Here is the data sheet from the manufacturer which is correct. http://www.everestcase.com/en/productsd.php?pid=245. I have physically verified this against the case. This is a variation of the box that comes with the Shapeoko but doesn't have the hole in the back for the heat sink and the holes in the top for all the stepper wires. Commenting only on the Shapeoko/Stepoko version. Holes in the top allow sawdust to enter the box and drop into the wiring terminals. Lack of a transparent cover means you can't see the dozen or so indicator LEDs on the Stepoko. Not a good design for the CNC application. I just ordered a DCP-USBCB-SC (micro USB to solder holes) and a cap 6295 (Both are Switchcraft products). The hole is .69 dia. flattened to .582 on one side. I was wondering if Sparkfun could offer a more custom weather proof enclosure. Like have some standard options for feed throughs and where they are located. I'm just thinking SF might have the knockout punches available for different connectors that a hobbyist wouldn't have on hand. Hey there is now an adapter plate EPS file for free download on Ponoko at http://www.ponoko.com/design-your-own/products/enclosure-flanged-red-adapter-plate-11754. It includes bolt patterns for Arduino, Arduino Mega, pcDuino, Beaglebone, and Raspberry PI. Recommended making material: 3mm Acrylic. Some dims, where estimated but the most important ones such as hole placements, post heights, etc are from the drawing. What kind of plastic; "soft", hard, breakable? 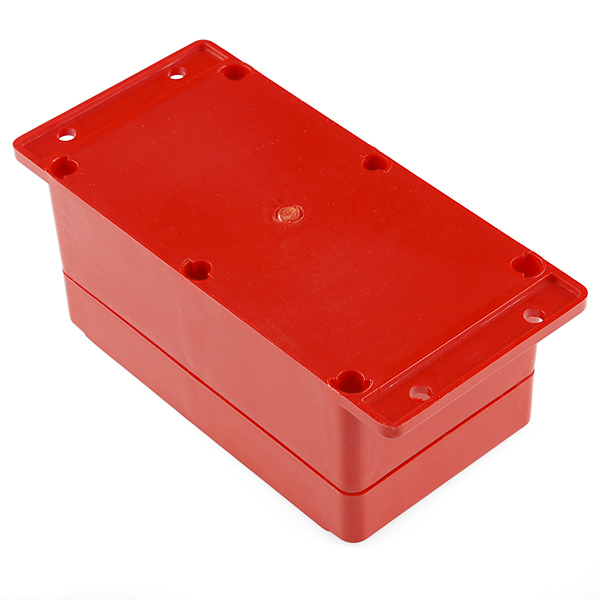 Hi , i am waiting to get one,before it arrives i would like to share this http://grabcad.com/library/caja-roja-sparkfun it is an approximate CAD model of the enclosure. Can I have a bluetooth module inside and still get good signal? This is a nice box, really solid. Mine came with only 2 screws, which isn't a big deal. However, it's really hard to mount an Arduino in, and I think I'm going to have to do some dremel work to fit a ScrewShield. The 11/16/12 New Product Post video states that this box (and the related USB sealed connector and cap) is "submersible". Does anybody have any feel for how deep this box might be submerged prior to leaking or other failure vector? The IP65 rating is not a "submersible" rating. It is dust tight, and tested with water jets a minimum of 4.35 psi at 25 gallons per minute for 3 minutes minimum from about 9 feet away. Just got my box. The internal mounting holes don't really line up to anything useful. My UNO can orient with one hole but other configurations make it interfere with the walls/insert posts. It's still a fine box, but I'm going to have to make a plate to go inside which I can mount to. I see SFE has more important things to do than answer all the product questions. This would be a good item to use to put the UNO's and shields in "out in the field." BUT..would really like to know about the UV inhibitors. Must not have them if SFE won't answer. That would be a negative for the product. Also how about even putting a UNO inside one. Dorje's question was never answered and well as dbc's. Must not be good for outdoor use. Hey Robert -- how about doing an update on your post and maybe for us "builders" out here speck whether Arduino boards might fit inside. A bit of frustration out here as you can tell.. Oh well... back to Mouser I guess. Hi, we don't currently have the man power to check all the comments on all 3000+ products. While we do try to comment on things when we see them as you can see that might take a year for us to see them. If you have specific questions email our tech support staff (techsupport@sparkfun.com) and we'll get back to you. The dimensional drawing is excellent for this product. I wish we had that kind of information for all enclosures. Anyway, can anyone check if the long dimension of an Arduino UNO (the 2.7 inch side of the 2.7x2.1" board) fits in between the screw holes on the inside? The dimension is listed as 69mm on the drawing, which is 2.717", but the dimension on the drawing doesn't go to the correct line. Also, is it possible to fit three Unos in side by side or maybe overlapping a bit? 3x2.1"x25.4mm/in=160mm, whereas the inside is just 152mm, but I'm not sure how accurate those Arduino dimensions are. I'm also interested in the dimensions of the label recess. Weather tight! Excellent! This is my 40th year as a licensed ham, so I've spent my fair share of time scrounging or creating wx-tight boxen. @tpobrienjr excellent point on UV inhibitors. @SparkFun -- did you spec UV inhibitors, or just red plastic? WX-tight w/o UV protection kind of misses the point. What kind of plastic? ABS? Does the plastic have UV inhibitors in it (i.e. for outdoor application)? Nice enclosure, especially for the price. I'll definitely grab some of these for home automation projects. It looks like the top surface has a recess for a decal - is a dimensioned drawing available for that? The proper application of cutting, clear plastic and hot glue can fix that. "Hoffman Boxes" would also be a nice commercial choice. Any commercial/industrial electrical supply house should have them - but they are going to be pricey. I have used them outdoors, in washdown environments, and hazardous environments. They work well, but Hoffman charges accordingly. Best for use when someone else is paying. And yet you have probably used them at some point in your life... like watching TV. Learning something new every day is what keeps this stuff fun. 50+ years doing electronics and still going. I have ordered many of these enclosures, and they're great for just about anything that needs a case. Very durable, and a great price compared to other competitors! 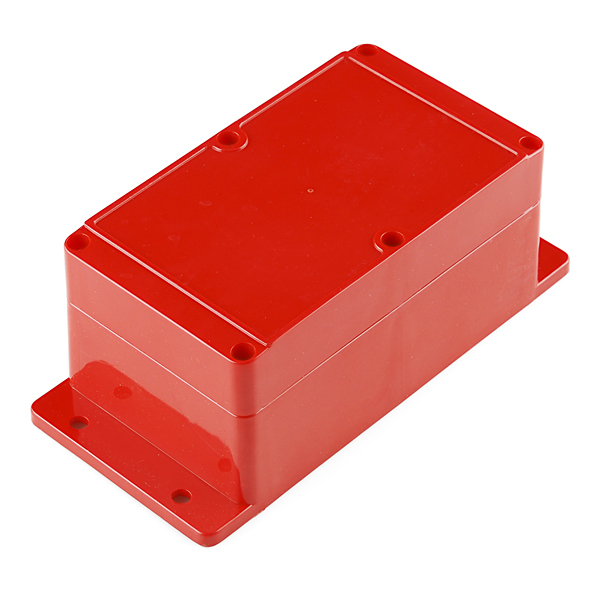 Sturdy construction, bright red and overall a great enclosure. What I would really like is a 1/2 size Big Red Box, that version I would buy more often as most of my projects don't require anything this large. Just a suggestion. This is a good solid enclosure. The one challenge is the thick plastic needs to be cut slowly if you cutting openings or it will melt closed again. It is also thick enough that you may need to shave the surface to add things like female audio jacks made for thinner enclosures. It's a good box, thick and solid, but not too hard to cut. 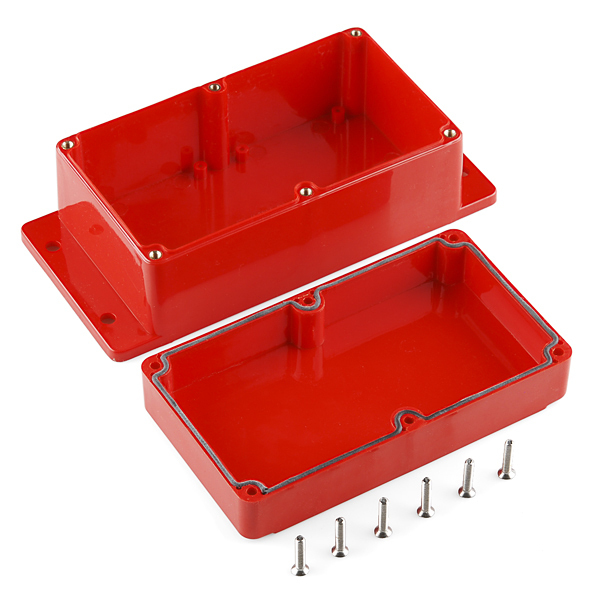 I wish Sparkfun would offer a mounting plate that matches the internal mounts (I think they match some boards that Sparkfun sells, but just selling an acrylic or metal plate would be nice). It's large, sealed and drills/mills like a dream. Doesn't Crack or splinter when dropped. Works well with the add on protoboard. Not flimsy, good dimensional control. Be sure to use slow drilling and machining speeds to avoid melting..
A couple of smaller options would be nice.. Using it to protect an outdoor Arduino that's monitoring my pool equipment 24 hours a day.. Pleasant surprise to find that the box is translucent so that I can see the flashing LEDs at night which confirm that it's operating fine. I typically make control panels out of 30.5mm pushbuttons and this works great for that purpose. Can fit two of the buttons on the panel and it looks very clean and professional. The plastic this is made out of is incredibly sturdy. It's actually somewhat difficult to cut into but makes for a really great housing for a project. Would be nice to see these in a variety of colors besides bright red.